3 GERMANY EXPANDS Hitler rebuilt the military in Germany. His goal was to start a new empire. 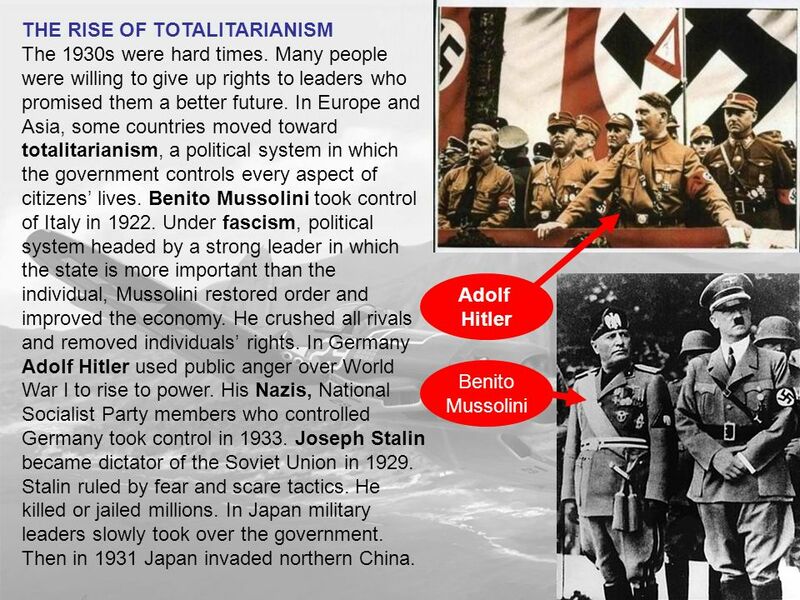 In 1936 he joined Italy and Japan to form the Axis Powers. 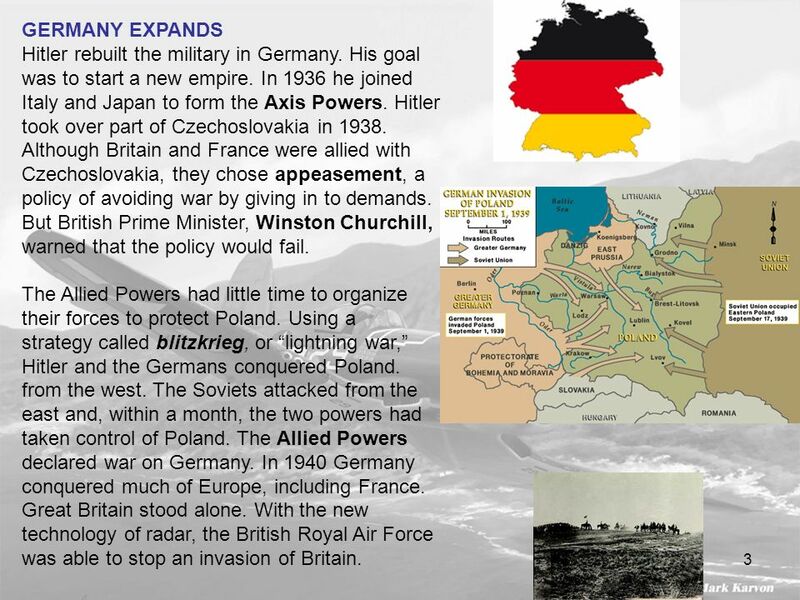 Hitler took over part of Czechoslovakia in Although Britain and France were allied with Czechoslovakia, they chose appeasement, a policy of avoiding war by giving in to demands. But British Prime Minister, Winston Churchill, warned that the policy would fail. The Allied Powers had little time to organize their forces to protect Poland. Using a strategy called blitzkrieg, or “lightning war,” Hitler and the Germans conquered Poland. from the west. The Soviets attacked from the east and, within a month, the two powers had taken control of Poland. The Allied Powers declared war on Germany. In 1940 Germany conquered much of Europe, including France. Great Britain stood alone. With the new technology of radar, the British Royal Air Force was able to stop an invasion of Britain. Most Americans wanted to stay out of the war in Europe. In 1941 the Lend-Lease Act was passed to allow the president to aid any nation vital to U.S. defense. The United States began sending supplies to Britain and other allied countries. The United States also decided to act against Japanese imperialism. When Japanese forces captured French Indochina in July 1941, Roosevelt protested. He demanded that Japan withdraw. Then the United States froze Japanese funds in its banks and cut off exports to Japan. This angered Japan. On December 7, 1941, Japan attacked the naval fleet at Pearl Harbor in Hawaii. 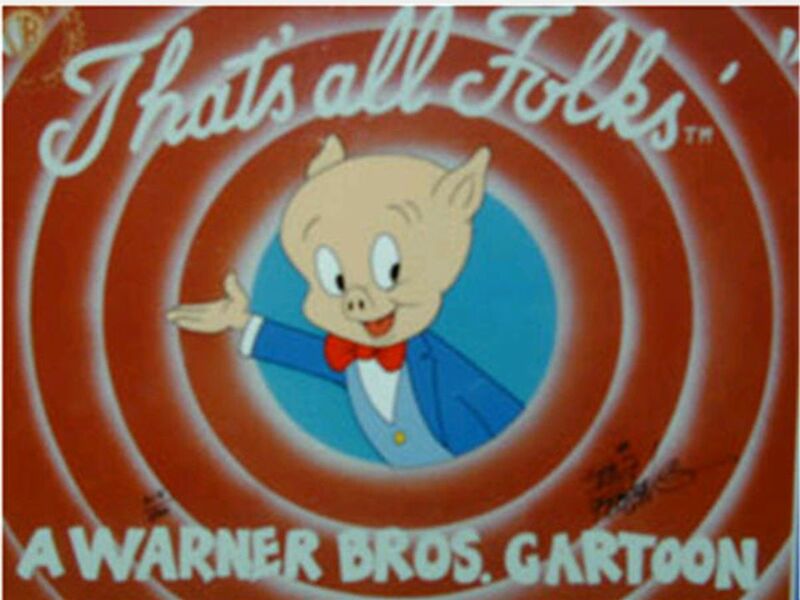 The United States declared war on Japan. Then Germany declared war on the United States. The United States joined the Allies, entering another world war. Japanese forces bombarded the American naval fleet for several hours in the attack on Pearl Harbor. Eighteen ships were hit, and more than 2,400 Americans were killed. The Great Depression finally ended as the United States mobilized for war. The War Production Board was created. This board was created to oversee the conversion of factories to war production. The Selective Training and Service Act started the first peacetime draft in the history of the United States. More than 16 million Americans served in World War II. 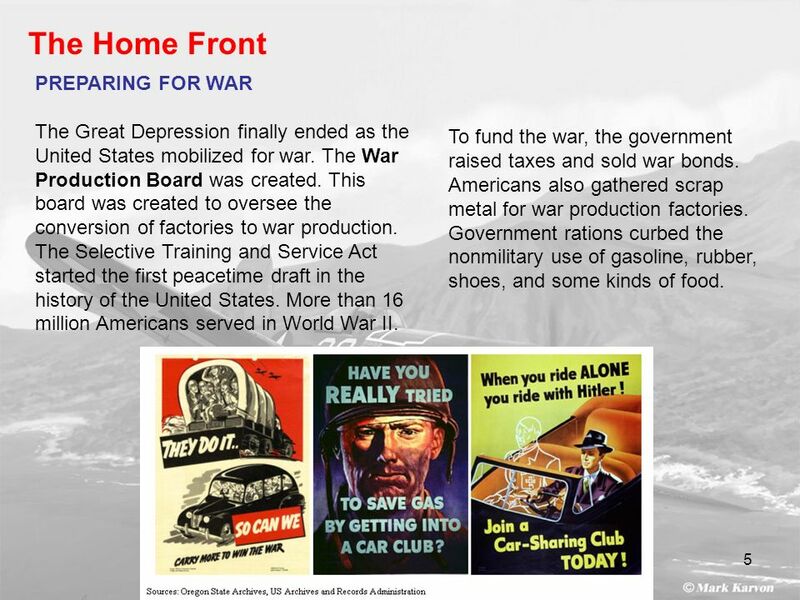 To fund the war, the government raised taxes and sold war bonds. Americans also gathered scrap metal for war production factories. Government rations curbed the nonmilitary use of gasoline, rubber, shoes, and some kinds of food. Primary Source POSTERS Supporting the War Posters like these encouraged Americans to support their troops in a variety of ways. Building weaponry, growing food, saving scrap metal, and rationing all helped the war effort and allowed soldiers to have necessary supplies. “Rosie the Riveter” became a symbol of women’s work to support the war. Victory gardens planted at home SKILL allowed more commercially produced food to be sent from farms to troops overseas. 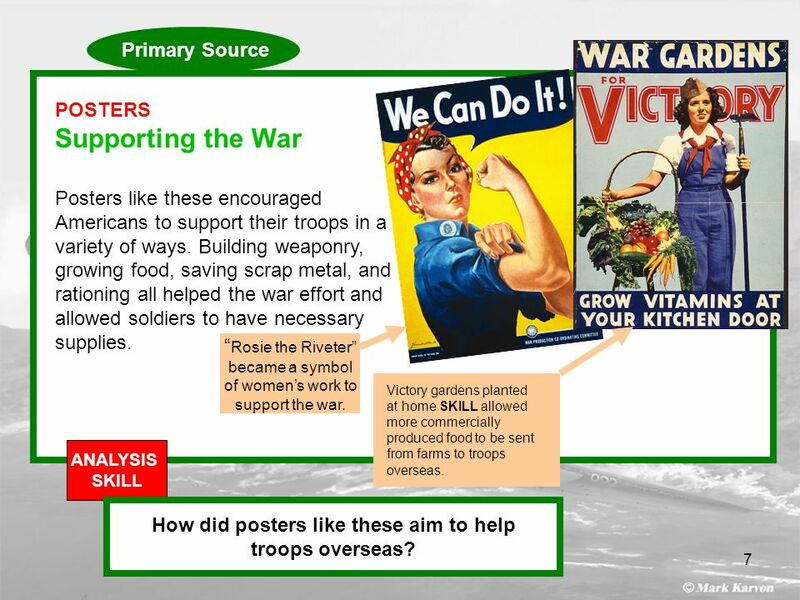 ANALYSIS SKILL How did posters like these aim to help troops overseas? Benjamin O. Davis was a graduate of West Point who became the first African American Air Force officer to achieve the rank of general. During World War II he led the first African American flying unit, the 99th Fighter Squadron. 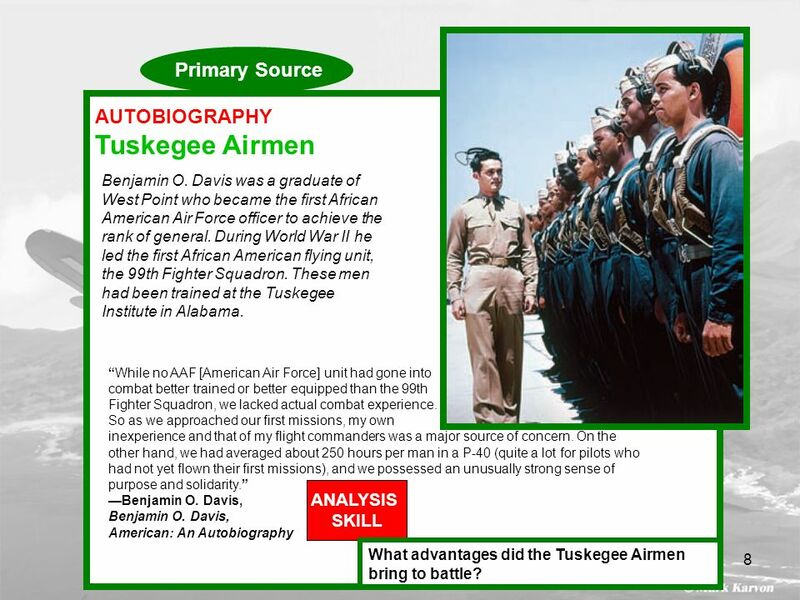 These men had been trained at the Tuskegee Institute in Alabama. “While no AAF [American Air Force] unit had gone into combat better trained or better equipped than the 99th Fighter Squadron, we lacked actual combat experience. So as we approached our first missions, my own inexperience and that of my flight commanders was a major source of concern. On the other hand, we had averaged about 250 hours per man in a P-40 (quite a lot for pilots who had not yet flown their first missions), and we possessed an unusually strong sense of purpose and solidarity.” —Benjamin O. Davis, Benjamin O. Davis, American: An Autobiography ANALYSIS SKILL What advantages did the Tuskegee Airmen bring to battle? 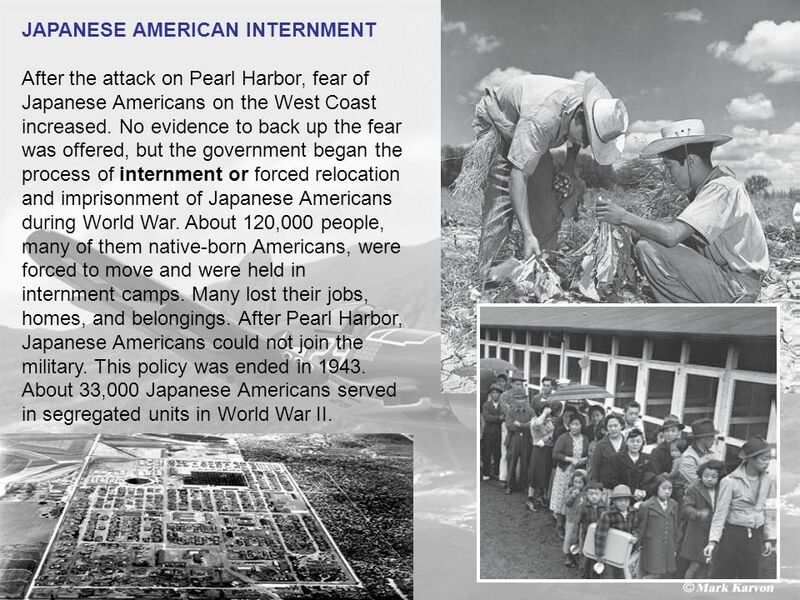 After the attack on Pearl Harbor, fear of Japanese Americans on the West Coast increased. No evidence to back up the fear was offered, but the government began the process of internment or forced relocation and imprisonment of Japanese Americans during World War. About 120,000 people, many of them native-born Americans, were forced to move and were held in internment camps. Many lost their jobs, homes, and belongings. After Pearl Harbor, Japanese Americans could not join the military. This policy was ended in About 33,000 Japanese Americans served in segregated units in World War II. THE ALLIES FIGHT BACK When the United States entered the war, President Roosevelt met with British prime minister Winston Churchill. They decided to focus first on Europe in their plans to defeat the Axis. The strategy called for defeating German forces in North Africa before an invasion of Europe. This angered the Soviet Union, which had been hoping for help on the Eastern front. New technology that had not been used in prior wars helped in the effort. Long-range planes dropped bombs on German factories, railroads, and cities, and sonar detected German U-boats. The Allies began using sonar to destroy German U-boats, shown here in a German harbor. By 1942 the Germans and the British were fighting in North Africa. They were fighting for control of the Suez Canal. The British forces stopped the German attack at the Battle of El Alamein, battle in which Montgomery’s British troops stopped Rommel’s Afrika Korps in North Africa in November American general Dwight D. Eisenhower, American general who commanded Allied forces in Europe; later elected U.S. president, led U.S. and British troops through Morocco and Algeria. They Trapped the Germans surrendered they surrendered in May 1943. 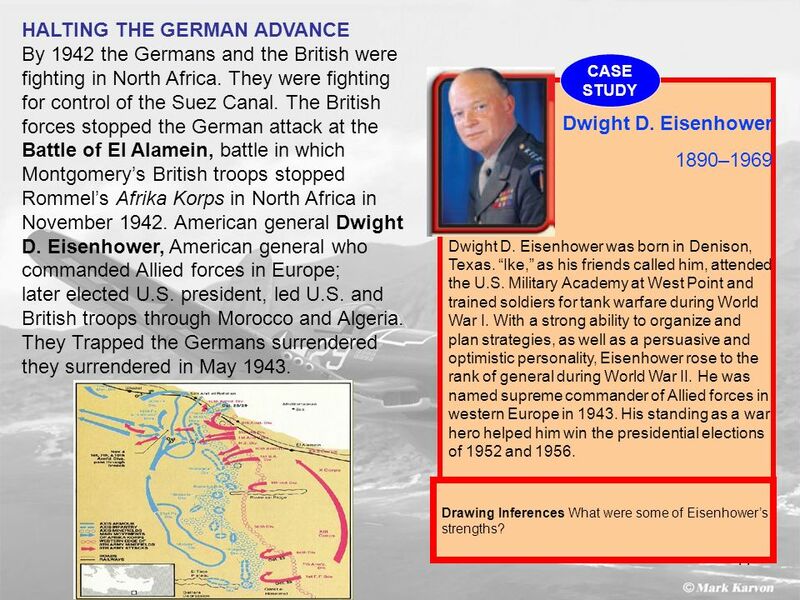 CASE STUDY Dwight D. Eisenhower 1890–1969 Dwight D. Eisenhower was born in Denison, Texas. “Ike,” as his friends called him, attended the U.S. Military Academy at West Point and trained soldiers for tank warfare during World War I. With a strong ability to organize and plan strategies, as well as a persuasive and optimistic personality, Eisenhower rose to the rank of general during World War II. He was named supreme commander of Allied forces in western Europe in His standing as a war hero helped him win the presidential elections of 1952 and 1956. Drawing Inferences What were some of Eisenhower’s strengths? moved into Europe. They attacked Italy in 1943. Italian leaders removed Mussolini from power and surrendered to the Allies. 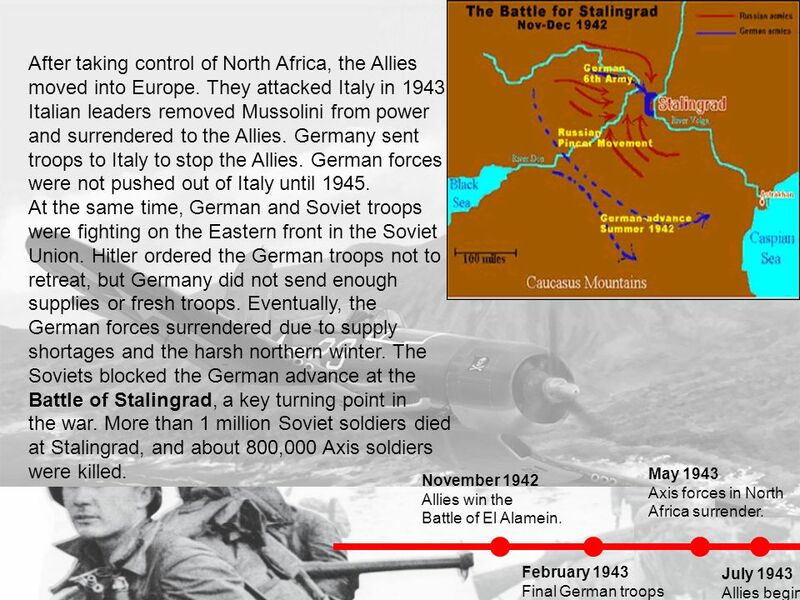 Germany sent troops to Italy to stop the Allies. German forces were not pushed out of Italy until 1945. At the same time, German and Soviet troops were fighting on the Eastern front in the Soviet Union. Hitler ordered the German troops not to retreat, but Germany did not send enough supplies or fresh troops. Eventually, the German forces surrendered due to supply shortages and the harsh northern winter. The Soviets blocked the German advance at the Battle of Stalingrad, a key turning point in the war. More than 1 million Soviet soldiers died at Stalingrad, and about 800,000 Axis soldiers were killed. May 1943 Axis forces in North Africa surrender. November 1942 Allies win the Battle of El Alamein. February 1943 Final German troops surrender at Stalingrad July 1943 Allies begin an invasion of Sicily. 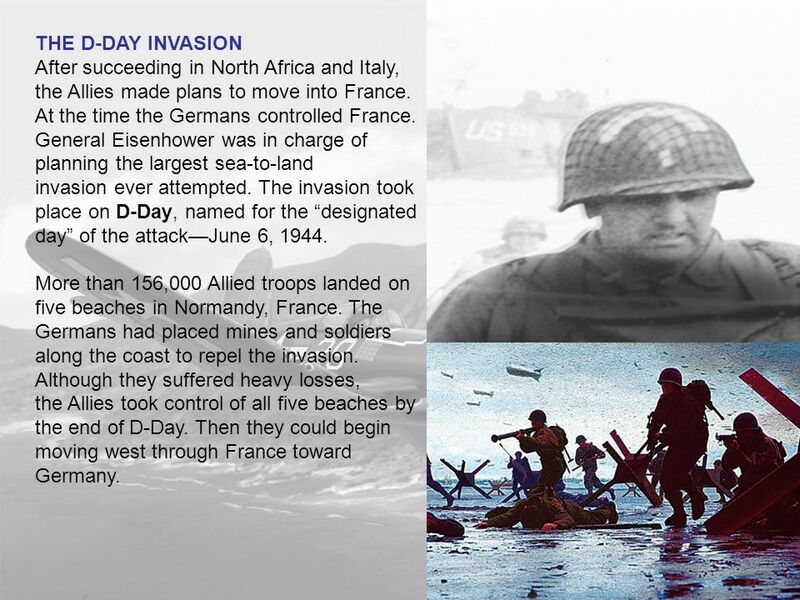 14 THE D-DAY INVASION After succeeding in North Africa and Italy, the Allies made plans to move into France. At the time the Germans controlled France. General Eisenhower was in charge of planning the largest sea-to-land invasion ever attempted. The invasion took place on D-Day, named for the “designated day” of the attack—June 6, 1944. More than 156,000 Allied troops landed on five beaches in Normandy, France. The Germans had placed mines and soldiers along the coast to repel the invasion. Although they suffered heavy losses, the Allies took control of all five beaches by the end of D-Day. Then they could begin moving west through France toward Germany. The attack on Pearl Harbor left the U.S. Pacific fleet weak. As a result the fleet was not able to react to the assault. Japan was able to conquer much of Asia and the Pacific. American forces under the command of U.S. general Douglas MacArthur were forced to leave the Philippines. MacArthur’s forces could not stop the Japanese advance. More than 600 Americans and 10,000 Filipinos died in the Bataan Death March, forced march of American and Filipino prisoners on the Bataan Peninsula. Code Talkers More than 40,000 Native Americans served in the U.S. armed forces during the war. About 400 Navajo Native Americans served as “Code Talkers,” relaying coded messages based on the complex Navajo language. 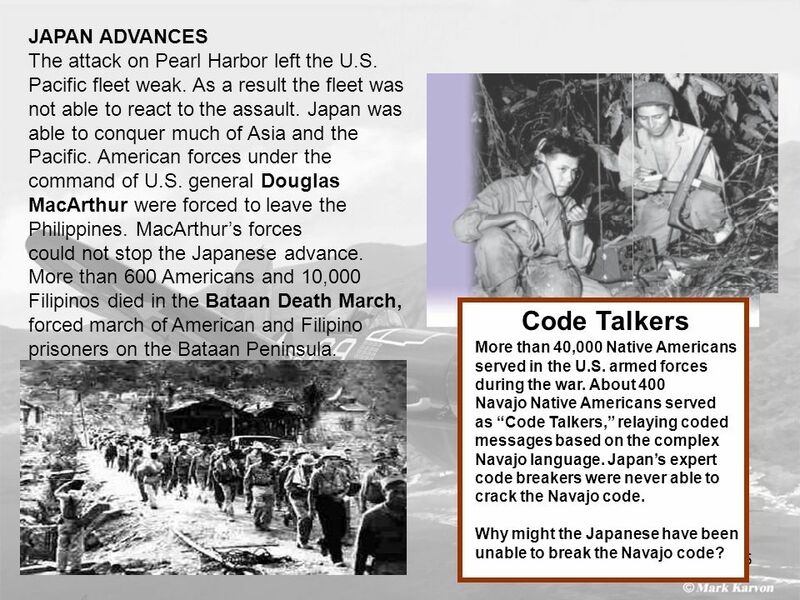 Japan’s expert code breakers were never able to crack the Navajo code. Why might the Japanese have been unable to break the Navajo code? 16 KEY ALLIED VICTORIES The Allies feared a Japanese attack on India, Australia, or the U.S. mainland. American code breakers learned to read the Japanese secret code, and Admiral Chester Nimitz found out that Japan planned to attack Australia. His aircraft carriers and fighter planes fought the Japanese in the Battle of the Coral Sea, and stopped the invasion. The Allies learned that Japan was planning a surprise attack on the Midway Islands. Nimitz was ready for the attack. The Allies destroyed four Japanese carriers at the Battle of Midway, badly weakening the Japanese Navy. This allowed U.S. Marines to invade Guadalcanal. Allied forces took full control of the island six months later. Kamikaze pilots as young as 17 flew their airplanes directly into enemy targets, committing suicide to fulfill their duty. 17 assault on the main Japanese islands. 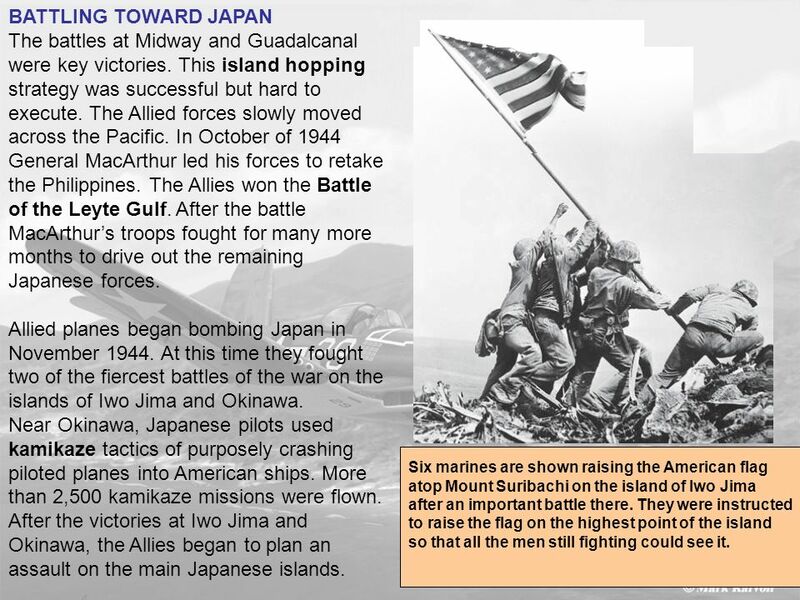 BATTLING TOWARD JAPAN The battles at Midway and Guadalcanal were key victories. This island hopping strategy was successful but hard to execute. The Allied forces slowly moved across the Pacific. In October of 1944 General MacArthur led his forces to retake the Philippines. The Allies won the Battle of the Leyte Gulf. After the battle MacArthur’s troops fought for many more months to drive out the remaining Japanese forces. Allied planes began bombing Japan in November At this time they fought two of the fiercest battles of the war on the islands of Iwo Jima and Okinawa. 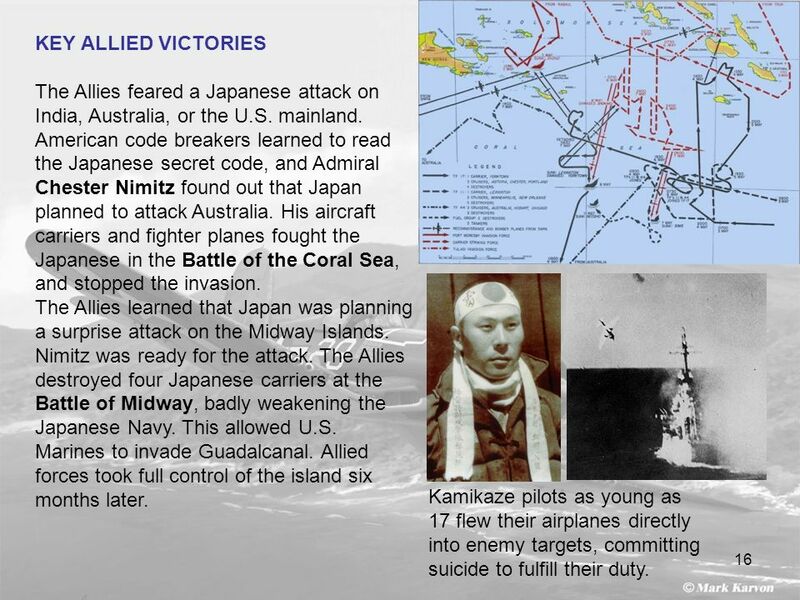 Near Okinawa, Japanese pilots used kamikaze tactics of purposely crashing piloted planes into American ships. More than 2,500 kamikaze missions were flown. After the victories at Iwo Jima and Okinawa, the Allies began to plan an assault on the main Japanese islands. Six marines are shown raising the American flag atop Mount Suribachi on the island of Iwo Jima after an important battle there. They were instructed to raise the flag on the highest point of the island so that all the men still fighting could see it. 18 GERMANY SURRENDERS After the D-Day invasion, hundreds of thousands of Allied troops landed in France. By August 1944 Allied troops had taken control of Paris from the Germans. At the same time, Soviet troops were headed for Germany from the east. In December Hitler ordered a massive attack against the Allies, whose planes were grounded due to bad weather. Germany pushed forward about 65 miles, creating a bulge in the frontlines. The Allies recovered quickly and their planes were able to fly. The Allied victory at the Battle of the Bulge put Germans on the defensive for the rest of the war. The Allies began bombing raids on German cities. These raids killed thousands of civilians. As Allied troops surrounded Berlin, Hitler committed suicide. The Germans surrendered on May 8, Roosevelt died before the end of the war. Harry S. Truman became president and faced the challenge of winning the war in the Pacific. 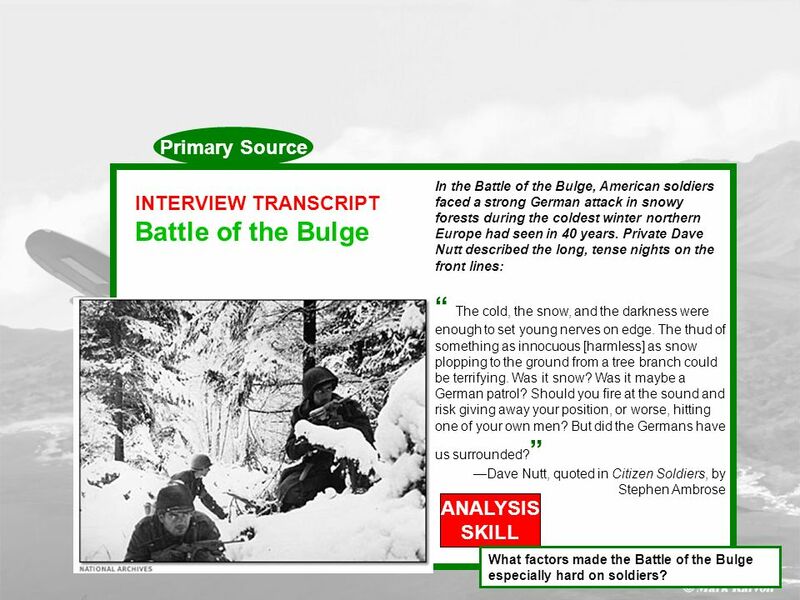 19 Primary Source In the Battle of the Bulge, American soldiers faced a strong German attack in snowy forests during the coldest winter northern Europe had seen in 40 years. Private Dave Nutt described the long, tense nights on the front lines: “ The cold, the snow, and the darkness were enough to set young nerves on edge. The thud of something as innocuous [harmless] as snow plopping to the ground from a tree branch could be terrifying. Was it snow? Was it maybe a German patrol? Should you fire at the sound and risk giving away your position, or worse, hitting one of your own men? But did the Germans have us surrounded?” —Dave Nutt, quoted in Citizen Soldiers, by Stephen Ambrose INTERVIEW TRANSCRIPT Battle of the Bulge ANALYSIS SKILL What factors made the Battle of the Bulge especially hard on soldiers? 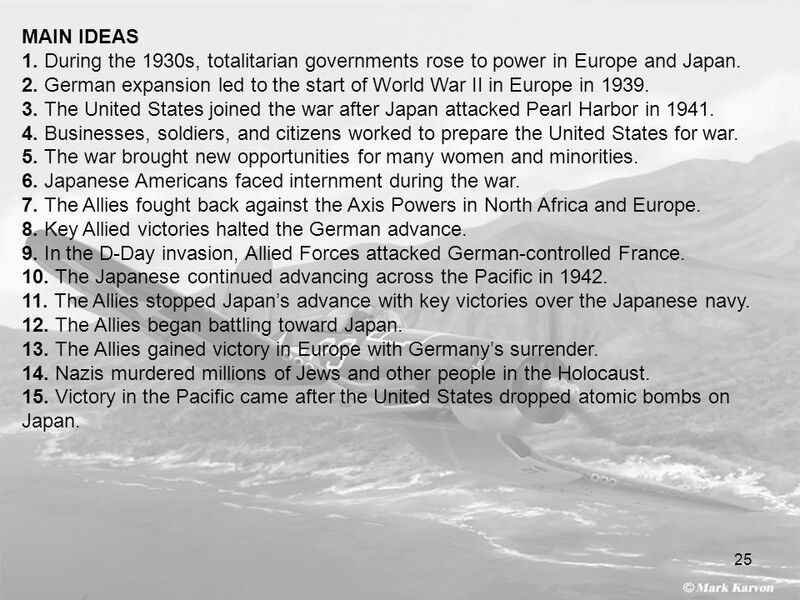 VICTORY IN THE PACIFIC The Allied planners projected that an invasion of Japan could cause more than 1 million Allied deaths. They had another option, based on research results of the Manhattan Project. 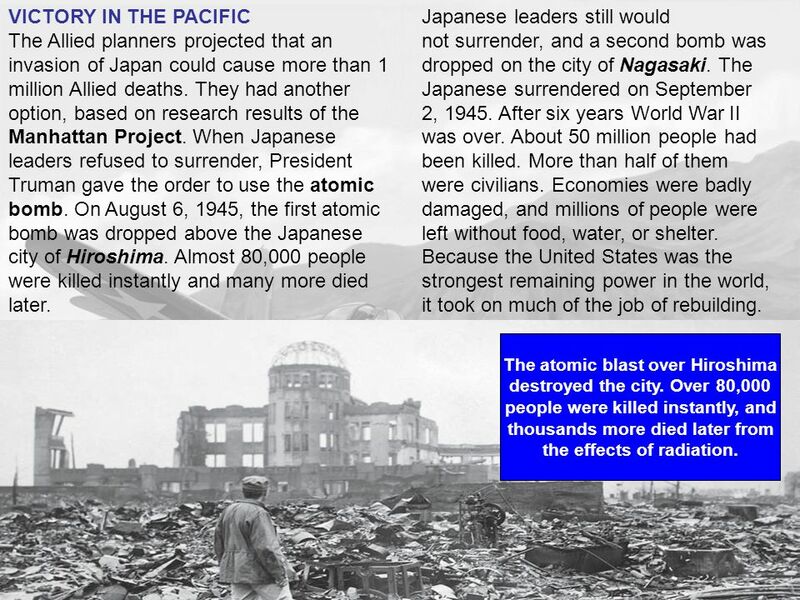 When Japanese leaders refused to surrender, President Truman gave the order to use the atomic bomb. On August 6, 1945, the first atomic bomb was dropped above the Japanese city of Hiroshima. Almost 80,000 people were killed instantly and many more died later. Japanese leaders still would not surrender, and a second bomb was dropped on the city of Nagasaki. The Japanese surrendered on September 2, After six years World War II was over. About 50 million people had been killed. More than half of them were civilians. Economies were badly damaged, and millions of people were left without food, water, or shelter. Because the United States was the strongest remaining power in the world, it took on much of the job of rebuilding. The atomic blast over Hiroshima destroyed the city. 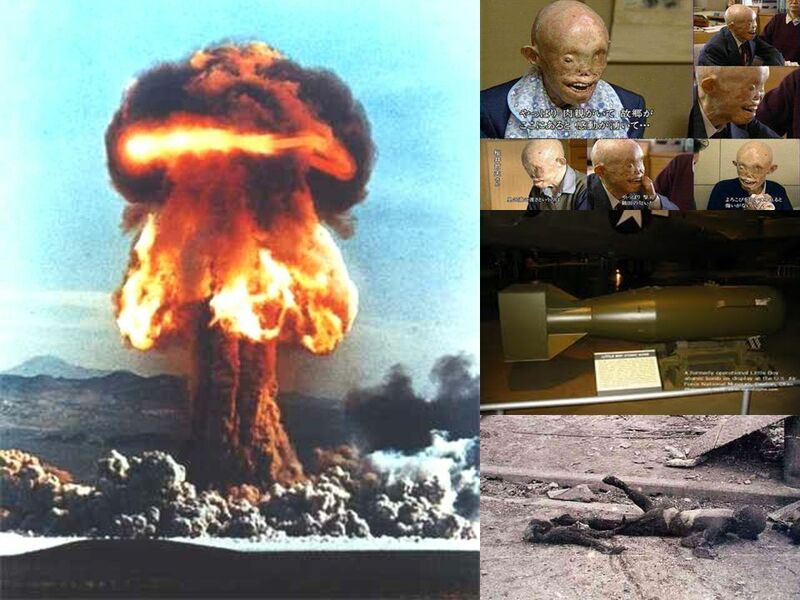 Over 80,000 people were killed instantly, and thousands more died later from the effects of radiation. As the Allied forces liberated Europe, they discovered that stories of the Holocaust, Nazi program of mass murder against the Jewish people were true. Soon after taking power, Hitler had begun a campaign against the Jews. The Nazis destroyed or seized property and moved the Jews to ghettos and concentration camps. Hitler’s “final solution” was genocide, extermination of an entire group of people. He planned to get rid of all of the Jewish people, killing millions in death camps. 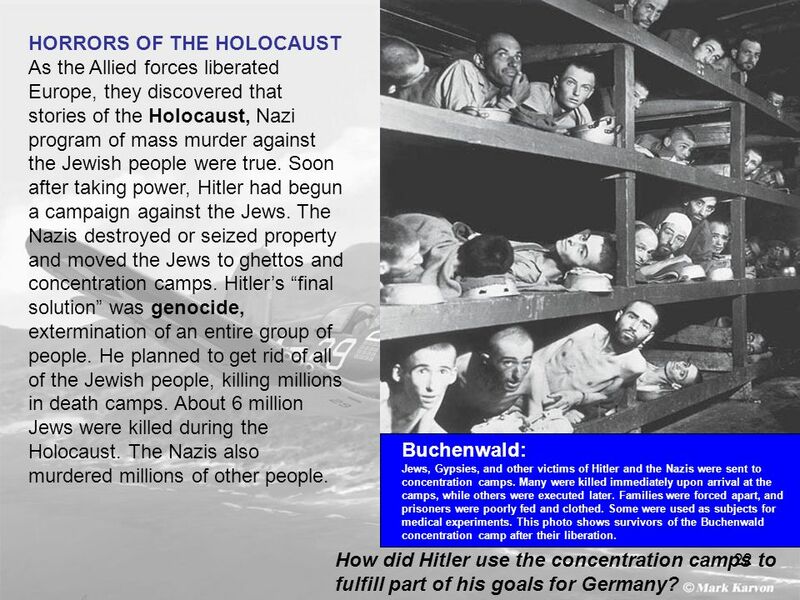 About 6 million Jews were killed during the Holocaust. The Nazis also murdered millions of other people. Buchenwald: Jews, Gypsies, and other victims of Hitler and the Nazis were sent to concentration camps. Many were killed immediately upon arrival at the camps, while others were executed later. Families were forced apart, and prisoners were poorly fed and clothed. Some were used as subjects for medical experiments. This photo shows survivors of the Buchenwald concentration camp after their liberation. How did Hitler use the concentration camps to fulfill part of his goals for Germany? 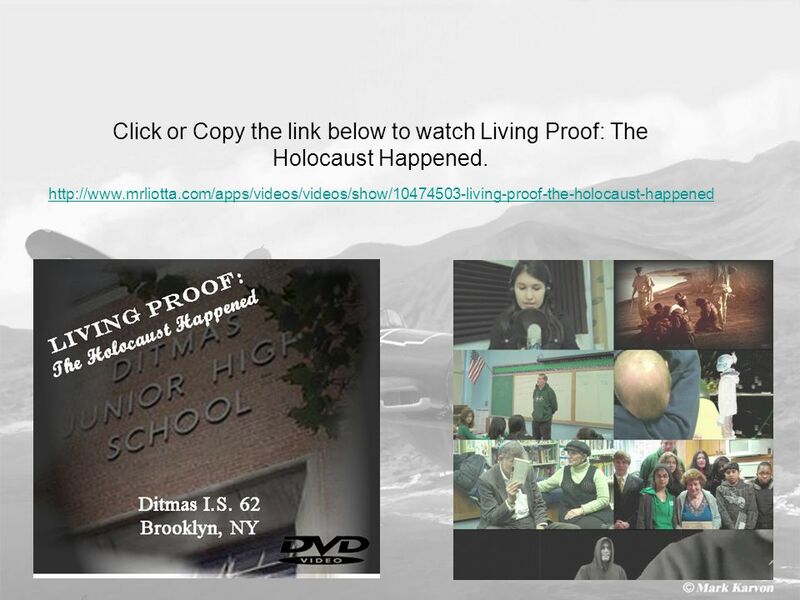 23 Click or Copy the link below to watch Living Proof: The Holocaust Happened. 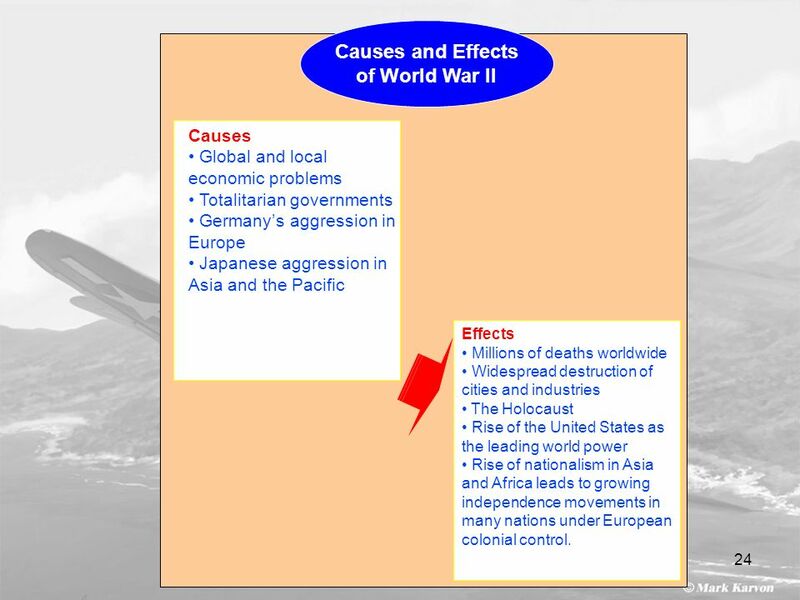 • Global and local economic problems • Totalitarian governments • Germany’s aggression in Europe • Japanese aggression in Asia and the Pacific Causes • Global and local economic problems • Totalitarian governments • Germany’s aggression in Europe • Japanese aggression in Asia and the Pacific Effects • Millions of deaths worldwide • Widespread destruction of cities and industries • The Holocaust • Rise of the United States as the leading world power • Rise of nationalism in Asia and Africa leads to growing independence movements in many nations under European colonial control. 25 MAIN IDEAS 1. 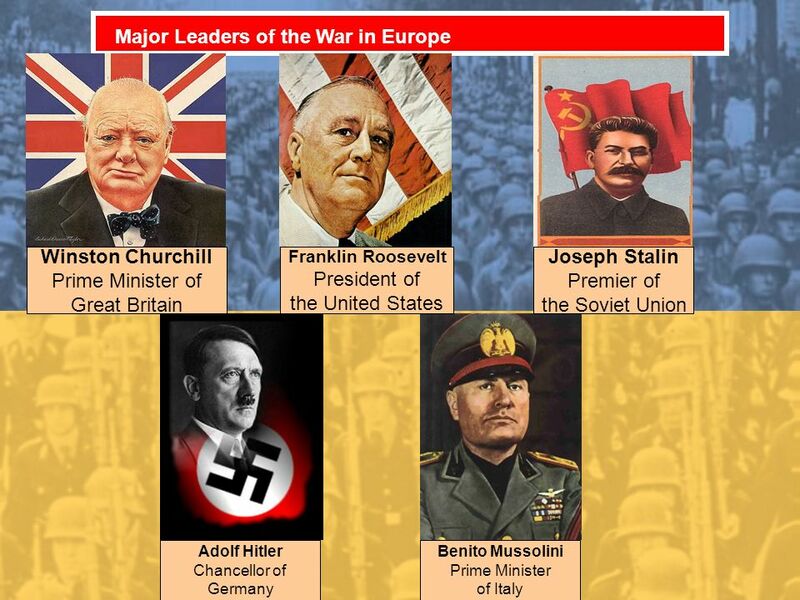 During the 1930s, totalitarian governments rose to power in Europe and Japan. 2. German expansion led to the start of World War II in Europe in 1939. 3. 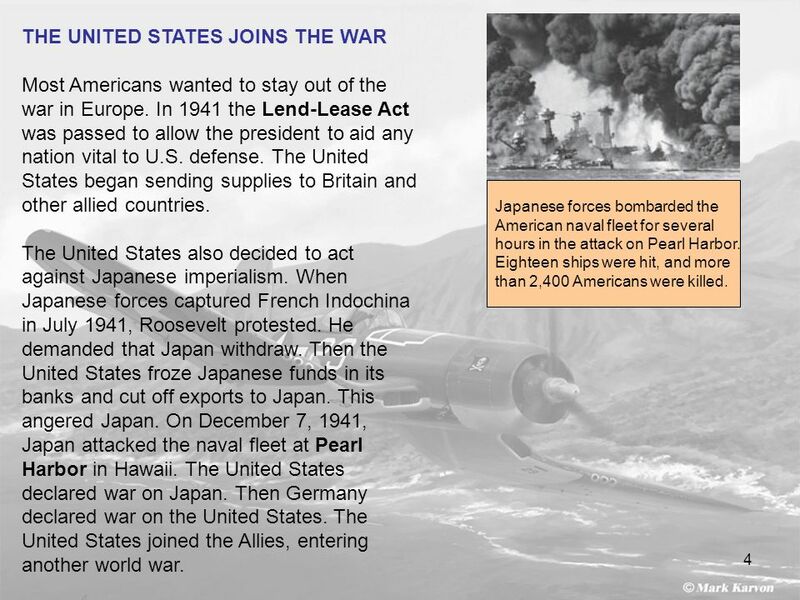 The United States joined the war after Japan attacked Pearl Harbor in 1941. 4. Businesses, soldiers, and citizens worked to prepare the United States for war. 5. 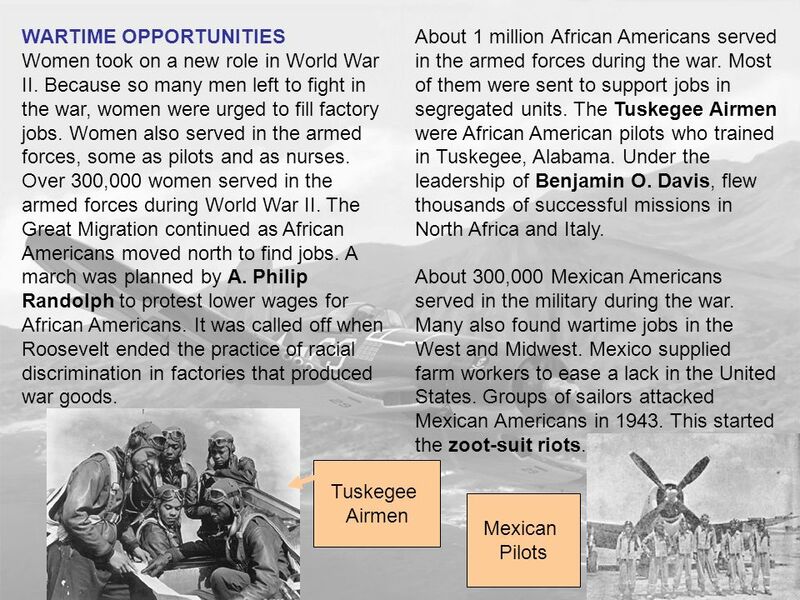 The war brought new opportunities for many women and minorities. 6. Japanese Americans faced internment during the war. 7. 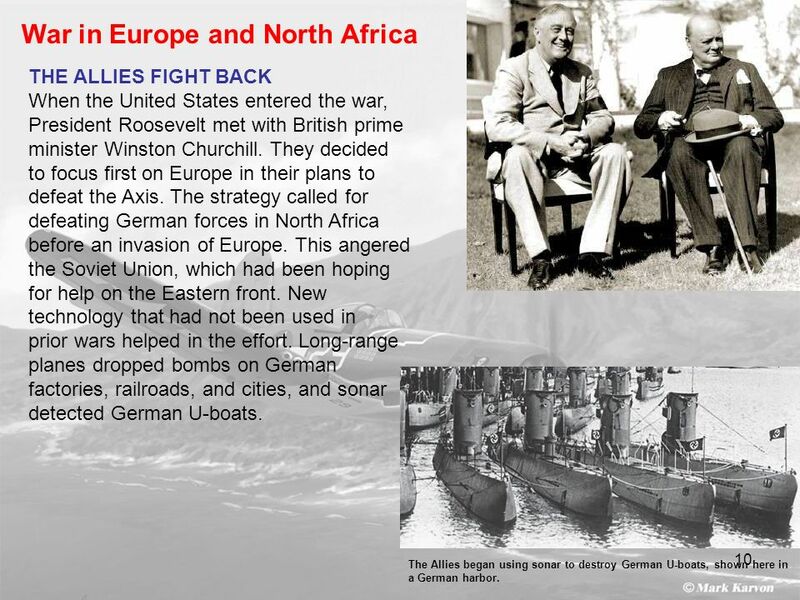 The Allies fought back against the Axis Powers in North Africa and Europe. 8. Key Allied victories halted the German advance. 9. In the D-Day invasion, Allied Forces attacked German-controlled France. 10. The Japanese continued advancing across the Pacific in 1942. 11. The Allies stopped Japan’s advance with key victories over the Japanese navy. 12. The Allies began battling toward Japan. 13. 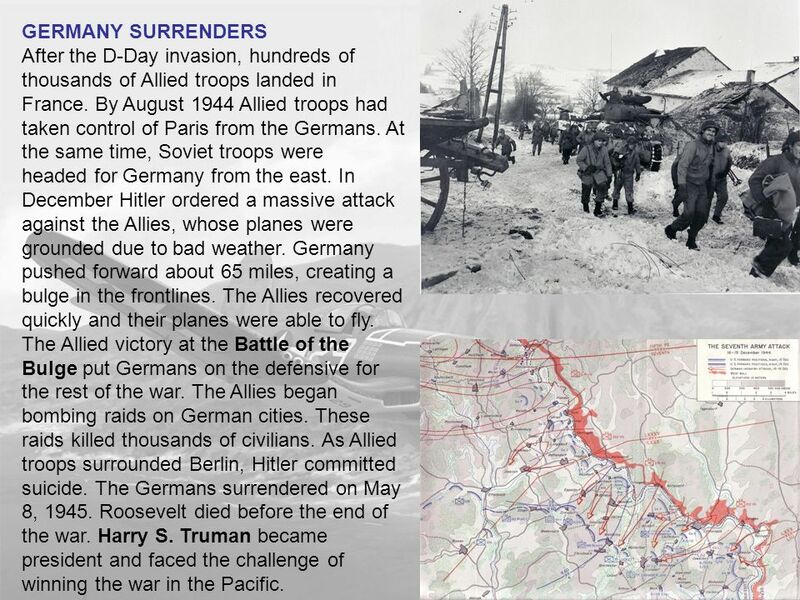 The Allies gained victory in Europe with Germany’s surrender. 14. Nazis murdered millions of Jews and other people in the Holocaust. 15. Victory in the Pacific came after the United States dropped atomic bombs on Japan. 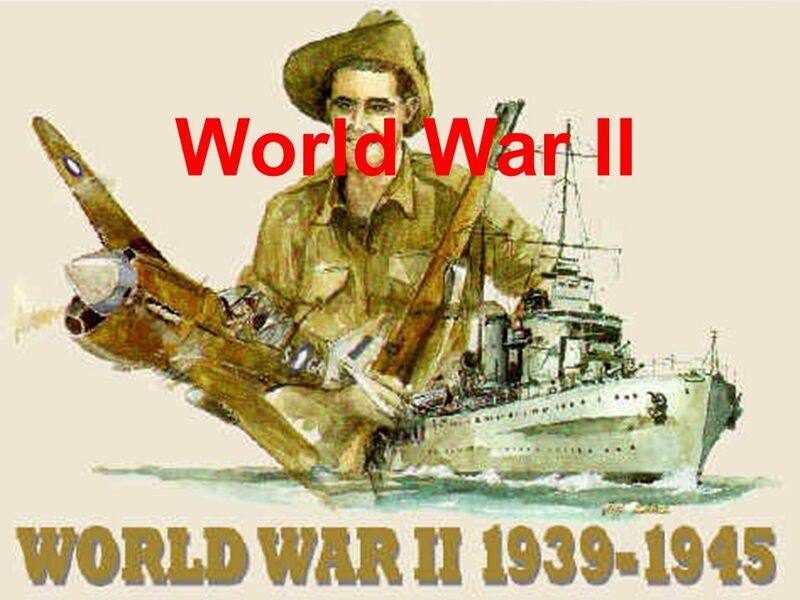 Download ppt "World War II." WORLD WAR II REVIEW. 1. It changed the minds of many Americans who didn’t want to go to war. WWII Review of sections 3,4,5. Where did the nickname G.I. come from? It means government issued. It was stamped on everything issued to soldiers during. D-Day Showed individuals are responsible for their actions, even in wartime Good Neighbor Policy Sold to help pay for war; kept inflation down Allied Powers. Battles of World War II European and Pacific Fronts.